Get Started (No CC Required)! 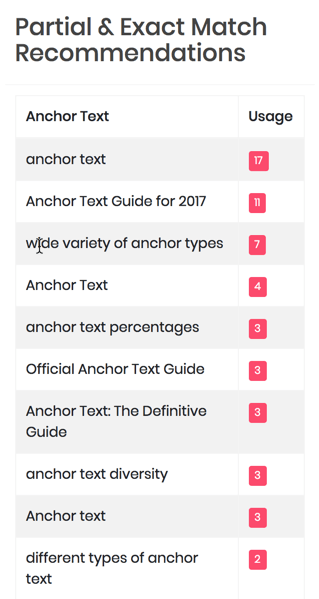 Start Selecting Anchor Text Like the Pros! Anchor text distribution analysis is a long drawn out process that requires complex excel formulas, and hand categorizing sometimes hundreds of anchor texts. Who has time for that?? We have automated the process and present you with a comprehensive overview of your site, as well as your competitors sites anchor text distribution profile. What would an Anchor Text Selection tool be without recommendations and insights right? We process all the data and then come up with an ideal aggregate distribution model based on your competition. Then we compare that to yours and make recommendation on what types of anchor texts you need in order to model yours to those who are already ranking on page 1. Hand calculating Anchor Text Distribution profiles can take hours. Well we have automated the process, and now what used to take hours now takes minutes. How much is your time worth? If we could save you 10+ hours a month, plus let you rest assured that the anchor text you are choosing is the same as your competitors, isn't that worth a few pennies a day? "What Anchor Text Should I Use? " 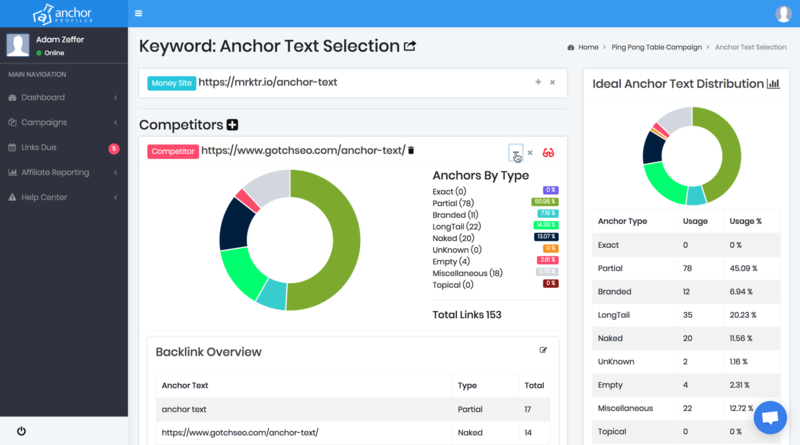 With the help of our application we give you all the insights and recommendations you need to confidently choose the anchor text for your linking campaigns. Want To Make Yourself Look Like A Boss To Clients?? What Is An Anchor Text Distribution Model? As a user on a web page the only real indication we have of the content that is on the destination page of a link is the Anchor Text. So it makes sense that Search Engines would use this data as a ranking factor. Back in the day you could just send a bunch of exact match links to your site, and it would virtually ensure you would rank for the term. Well as the search engines have gotten smarter they have built their algorithm to detect unnatural linking patterns. They can determine such patterns by looking at the best pages for a specific term, and then setting a baseline for the types of anchor text that are being used. That is why its so important to put in the work to make sure that you have a natural looking anchor text profile. AnchorProfiler.com allows you to put in your competitors url and backlink file, and then it processes those files to determine what type of anchor text distribution patterns they have. From that it creates an aggregate model that blends your competitors profile into a natural optimized model that you can follow, and build a link plan off of. Long Tail: The Long Tail Category is typically an entire sentence, where the user has taken a phrase or complete sentence and used that as the anchor text for a link. Typically this will be over 4 words long. Partial Match: The Partial match category is an anchor that contains part of the target keyword. So using the above example of "Best Blender" an anchor of "Juice Blender" would be a partial match anchor. Empty: The Empty anchor text category is typically links that are used on an image. For example if you created an InfoGraphic, and then promoted it, and people gave you reference credit by linking from the image back to your site. That would be considered an empty anchor text. Topical: The Topical Anchor text category is a bit more tricky to automate the selection so this will take a bit of work by the user. Topical Anchor Text is anchor text that is related to the keyword topically but there is not shared word in the anchor text. An example of this using the "Best Blender" keyword example would be an anchor of "favorite apple juicer". This anchor text is obviously related to the "Best Blender" keyword, but only topically. Unknown: The Unknown category is a fail safe category that allows us to present anchor text to you that our algorithm wasn't able to identify. The most common occurrence of this is when your anchor text doesn't match the language of your target keyword, or if you haven't identified all of the anchor text that should be considered branded. There is a simple process to manually updating these that only takes a few seconds. Anchor text selection can be the difference between an over optimization penalty if you go too specific, or losing out to your competitors because you were too cautious. Why not analyze your competitors ratio's to see what google has given their stamp of approval on? Up until now the process has been long and tedious, and involved multiple spreadsheets, complex formulas, and manual data entry. And that is just for ONE keyword, since every keyword has a DIFFERENT ratio. Well that is exactly the problem we are here to solve. We take what used to take hours, and turn it into something that takes minutes. Not only will we give you the ideal breakdown, but we will also show you the anchor text that your competitors is using most frequently to RANK for your target keyword! Remember Google has already told us what anchor text ratio they are ok with. Use this as a starting place, and once you are on page one you can decide if you want to go more aggressive or need to pull back a bit. If you are anything like me then you know the sense of satisfaction you get when you have analyzed the compeition, and feel confident you know just what it is going to take to get to page one. The problem is though that is just the start, now you need to start to build out your link plan. What can make this so difficult is that we aren't ever just working on 1 keyword, you probably aren't even just working on 1 site right? So now you need to figure out the velocity which you want to start linking, have some way to schedule a reminder to get those links placed, and then be able to keep a log of everything. Well that is EXACTLY what you can do with AnchorProfiler's link planning calendar and timeline. This allows you to take the ideal anchor text ratio, build out a link plan, and set reminders to get your links placed. 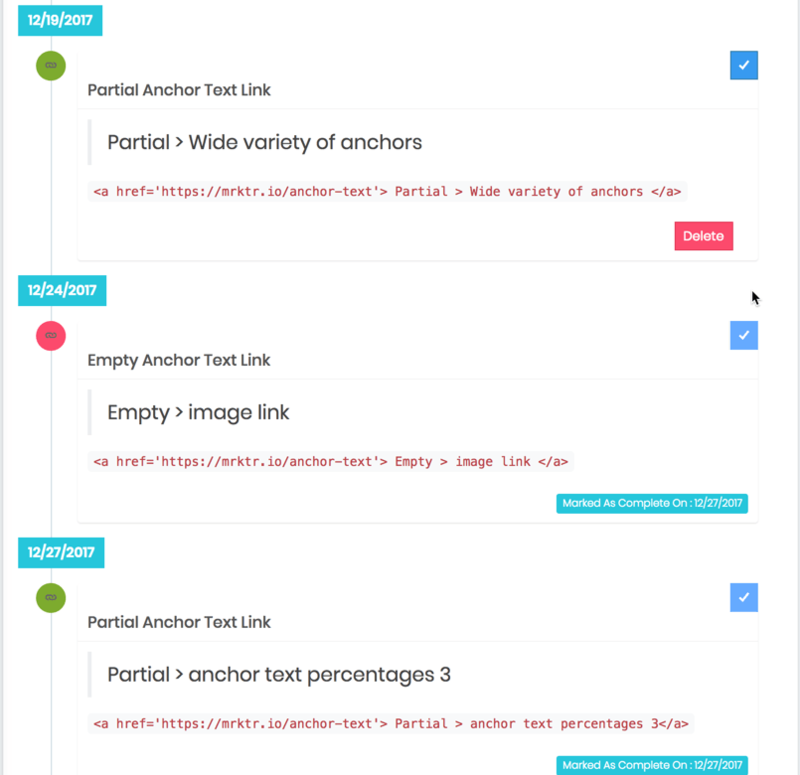 Once the time has come for another link you will receive a reminder, and you can go out and procure the link with the right Anchor Text based on your analysis. 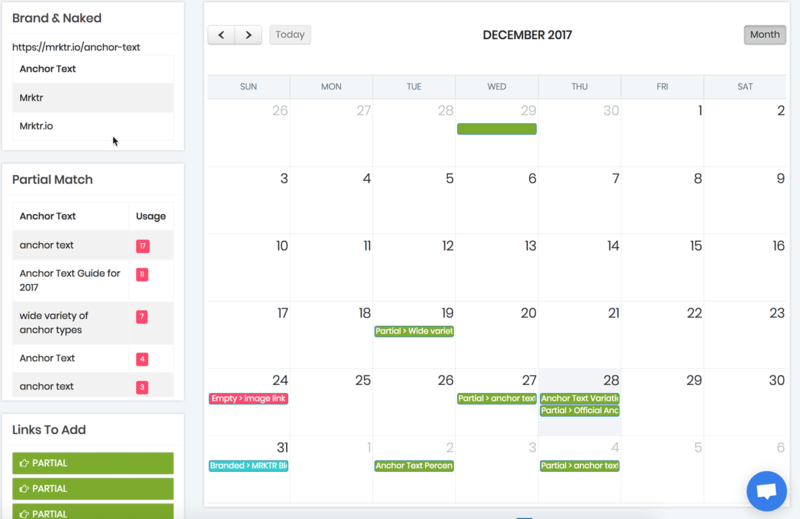 Once you have set your velocity in the Calendar now you can use the time line to help you track your links. If you are assigning tasks like purchasing pbn links to a VA then this is also a great way to ensure that they are using the exact anchor text you want. Set it when your mind is fresh on the analysis, and then forget it. When you get your reminder that a new link is due merely log in, grab the anchor code and provide that to your link service! Whether you are a blogger looking to better understand how to choose anchor text, or you are an SEO Ninja anchor profiler can help give you the confidence that you are choosing anchor text that the search engines are going to love, as well as help keep you away from over optimization.